I am open about my sociopolitical views. I'm center-right and in most respects socially conservative. Therefore, Salt of the Earth, a film that was made by and funded by Communists (or fellow travelers) might not be up my street. However, it is also about the plight of Hispanics being mistreated, and as a Hispanic, I am attune to how my ancestors are portrayed on film. Salt of the Earth is in some ways pretty accurate on some of the more unfortunate aspects of Hispanic culture, and it is a passion project for its worldview. Sometimes it goes a bit overboard in how the proletariat will rise up against the evil company, but on the whole Salt of the Earth is a fascinating portrait of a particular idea/ideology. Zinctown, New Mexico. 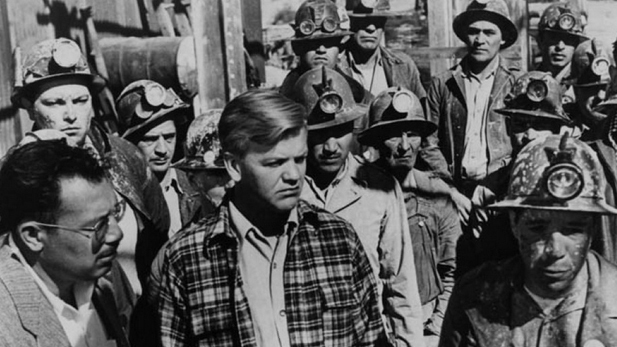 The Mexican-American miners of the Delaware Zinc Company are poorly paid and poorly treated. We turn to the Quintero family: husband Ramon (Juan Chacon) and his pregnant wife, Esperanza (Rosauro Revueltas, one of the few professional actors in the production). They are dirt poor, even for miners, particularly because the Mexican miners get paid less than their Anglo counterparts. This does not sit well with Ramon, and neither does the payment system in the U.S. "This installment plan, it's the curse of the working man," he declares in terms I know my parents always used when discussing finances. Anyway, Ramon and his fellow Mexican miners opt to strike for better pay, and while they have sympathetic white supporters the vast majority of other miners aren't keen on the idea. In particular, the Sheriff (Will Geer, better known as the Beloved Grandpa Walton on The Waltons) is fine if them Messicans stay in their place (a bit like Donald Tramp...er, Trump). The union itself is having some difficulty, as this is considered 'men's work', and the men, particularly Juan, finds the idea of women picketing...or worse, VOTING, appalling. However, because the men might lose their jobs if they do picket, the women take the initiative and form the picket line, taking advantage that they are not workers and thus, technically, are within the law. The crisis grows until the company, which runs the town and the Sheriff, has the women all arrested. Esperanza, who has had a political/social awakening, has joined the picketers, taking her baby with her. The company is not afraid to play hardball, down to trying to run the women over. In jail, the loud protests of the women for milk for their children among other demands so overwhelms the Sheriff he has no choice to give in. Eventually, the women earn the right to vote in the union, but the company, enraged by the Quinteros actions, force them out of the company home. However, they will not be denied, and in the end, triumph over the evils of capitalism. It has always been my policy to give positive reviews to films that I think are well-made, even if I disagree with their views, and negative reviews to films that I think are poorly-made, even if I agree with their views. As such, I give Salt of the Earth a very positive review because, given the low budget and few professional actors, it is a finely-crafted film. Of particular note, and something I think Salt of the Earth has not been given as much credit as it should, is in how accurate it is regarding the machismo and blatant sexism of the Mexican-American males back then (and up to a certain point, still now). Hispanic men can be more sexist than their Anglo counterparts, and their sexism goes beyond thinking that women should not do 'men's work', or even vote. Salt of the Earth is clear about how the men felt free to make decisions that impacted the women without so much as consulting them. It also shows that the sexism and the belittling the menfolk have against their sisters (Juan is a sexist pig, no way around it) held a pretty strong hold for years afterward. In the Chicano movement of the 1970s, Mexican-American women faced the same difficulties their mothers in the 1950s did, the men stubbornly insisting a woman's place was in the kitchen and as support staff (Dolores Huante be damned). Salt of the Earth is a very well-made film if you don't mind accepting that to a point, it is propaganda. Skillfully made propaganda in the same way Triumph of the Will is a skillfully-made propaganda, but propaganda nonetheless. This film has the involvement of many left-wing people, all of whom had been blacklisted during the McCarthy Era by Hollywood. (Geer, Revueltas, director Herbert Bibermen, screenwriter Michael Wilson, who had been one of the infamous Hollywood Ten). Salt of the Earth shows what can happen when a group of like-minded individuals are given free rein without any sense of censorship. The people behind the film were craftsmen, but they also could not help going at times overboard in their depictions of 'good' versus 'evil'. That line about installment plans being 'the curse of the working man' sounds rather forced, and the final image of Esperanza (there must be a reason the main female character's name is "Hope") is almost divine in how she (and by extension, the workers) are shown. Even in some of the professional acting things are a bit overboard. Revueltas at times seems like she was the amateur of the group, and while it's clear Chacon isn't an actor it's hard to be too harsh. I do compliment Geer for not going overboard in making the Sheriff into a totally cartoonishly evil character, and shows that perhaps one needed professionals. Still, on the whole Salt of the Earth is a strong film and a fine example of how to use film to further a sociopolitical viewpoint. As a side note, the screening of Salt of the Earth I attended at the Plaza Classic Film Festival had brief conversations with the descendants of the original miners after the film. One of them, Elisa Sanchez, a daughter of a miner, pointed out that Local 890's Women's Auxiliary had been formed in 1948 and so was organized prior to the events of the film. Ernestian Kirker, who I think was Ms. Sanchez's cousin, confirmed that children did march in the picket line and made an eloquent statement. "I'm the legacy of what they did. It's my story. It's my people". There was another person there, whom I know from work who is also related to the miners, whether by blood or marriage I don't know. I can say on a personal level she is rather unpleasant to work with and she would make the mining company proud in her attitude and behavior towards the people who work under her. She shall remain anonymous. We did also learn that there was a 'tiny amount' of Communist funding for the film, though my memory is vague on whether the funding came from the American Communist Party itself or from Communists themselves. I also note that someone had mentioned that Michael Wilson did not receive credit for Lawrence of Arabia as a result of being blacklisted. There is still dispute about Wilson's role in the Lawrence script. He had written a script but director David Lean opted to essentially throw it out and bring in playwright Robert Bolt to rework the screenplay. The speaker I think might have had another David Lean film in mind, The Bridge on the River Kwai, which Wilson and another blacklisted writer, Carl Foreman, wrote. The year of Bridge on the River Kwai's release, the screenplay was credited to the novel's author, Pierre Boulle, even though Boulle spoke no English, let alone wrote in English. Therefore, I think Salt of the Earth is an excellent film, an interesting study in film as agitprop, and a historic film on the gender/civil rights of a hereto unrecognized community.